i5 Weighing Electronics: Adopt it for these 5 reasons! Weighing electronic ranges are wide and versatile. This is a strong asset when seeking a specific weighing application related to an industry. But it turns into a nightmare when your activity solely requires simple weighing functions. This is when the i5 indicator comes in, offering you the key functions without any compromise on quality. 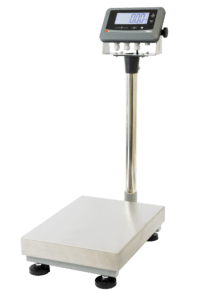 3 weighing modes: weighing, counting, animal weighing, to cater for your main weighing needs. Quick start / Readable: you can use the i5 even in harsh environments. Its touch screen does not require any pressure, and the weight is displayed on a large-sized highly readable screen. Productivity: some of the i5 functions do not require the use of the keyboard, such as, for example, the hold of the timed out display when removing the load or during automatic taring. Battery supply option: the optional lithium-ion battery offers a one-week use autonomy (depending on the conditions of use) and recharges overnight. Mobility: communicate wireless and send your weigh results through the most modern peripherals with Bluetooth connection and our Weigh2Go application. The application offers remote access to common functions such as taring and printing. With our integrated voice command, your operator can focus on his work and easily interact with his weighing station. The i5 can be either integrated to your installation or installed on any PRECIA MOLEN platform.